A solid mid-range option for those that prioritise one-handed usability, great battery life and premium build quality over big specs. Last year's Galaxy Alpha and Note 4 signified the beginning of the end for all plastic, high-end Samsung smartphones. While the inclusion of a metal frame on both devices was certainly welcome, the Korean firm wasn't ready to forgo its beloved plastic entirely. With the more affordable A Series, Samsung has bowed to consumer pressure, opting for a metal unibody design, waving goodbye to the company's signature removable rear cover and battery. Being the least expensive of Samsung's new mid-range line-up, it's unsurprising that the Galaxy A3 is neither the most powerful nor the most feature-rich smartphone on the market. Yet it aims to offer consumers a viable compact option, with build quality comparable to handsets costing twice as much. And Samsung's reputation as a manufacturer is another point in the A3's favour. 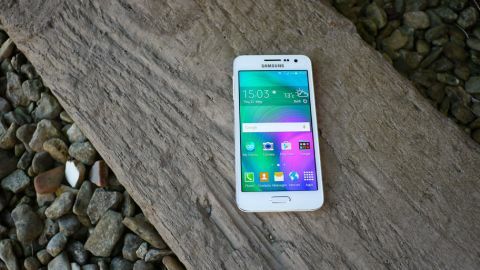 The Galaxy A3 can be snapped up SIM free for around £225 (roughly $350, AU$440). Those in the UK who'd prefer to purchase the Galaxy A3 on a subsidised deal can do so, with handsets available on a 24-month contract available for as little as £17.50 per month. Even in brightly-lit outdoor conditions, the screen on the Galaxy A3 is perfectly legible. This pricetag puts the Galaxy A3 up against some tough mid-range competitors, including the mighty OnePlus One and the capable Honor 6. Yet due to the increasing dominance of big-screen smartphones, the A3 could be a standout option for users who crave premium build quality and a sub 5-inch display, but cannot afford a costly device like the Sony Xperia Z3 Compact. On paper, the specs of the Galaxy A3 look rather run-of-the-mill, with Samsung's diminutive offering only packing a 4.5-inch qHD display and a Qualcomm Snapdragon 410 quad-core processor, backed up by 1.5GB RAM. Providing the juice is a 1900mAh non-removable battery, and as you'd expect there's 4G LTE and NFC connectivity on board. Plenty of storage is available, with 16GB of internal storage and the option to add a further 64GB via a microSD card. Arguably the externals are the real draw here, with the Galaxy A3's metal unibody design looking and feeling far more refined than many previous Samsung smartphones. At just 110g, the A3 is extremely lightweight (possibly too light for some), but this doesn't detract from the impressive overall build quality. The physical home key feels well constructed, though it doesn't include a fingerprint reader. On the front the Galaxy A3 retains the typical Samsung design language with a prominent physical home button sitting in the centre below the display, flanked by the usual recent apps and back keys. Located up top above the bold Samsung branding is a silver earpiece, along with proximity and ambient light sensors and a 5MP front-facing shooter. Surprisingly Samsung opted not to include an LED notification light. This is quite disappointing considering the A3's mid-range price, although the screen does wake from sleep when a notification from a stock app is received. As on the Samsung Galaxy S6 and iPhone 6, the headphone jack is located on the bottom edge, alongside a microUSB port and single microphone. Samsung's choice to go with a qHD (quarter HD) Super AMOLED display for the mid-range Galaxy A3 does initially sound a tad bizarre, especially when many devices costing half as much are packing HD panels. A secondary microphone and removable Qualcomm 4G sticker are present up top. However in everyday use the resolution of a mere 960 x 540 is perfectly acceptable on the A3's modest 4.5-inch screen. For the most part, text and images look sharp and detailed. Upon first inspection you'd probably assume that the A3's display was of the 720P variety, as the low 245 PPI pixel density is only really noticeable when consuming lots of media. Colours are punchy, contrast is superb and viewing angles are incredibly wide thanks to the Super AMOLED technology. The A3's screen also has a decent maximum brightness level and is very responsive to touch. Along with its larger A Series siblings, the Galaxy A3 is one of the first smartphones to use Corning's latest Gorilla Glass 4. As well as providing more protection than previous versions, the glass is super thin with a diameter of just 0.4mm. This allows the A3 to retain a slim and light design, without compromising durability. Much like the Samsung Galaxy S6, both the volume rocker on the left and the power button on the right of the Galaxy A3 feel great thanks to their metallic finish. They offer great tactile feedback and feel far sturdier than the metal keys found on the mid-range Huawei Ascend G7. At just 6.9mm thick and weighing only 110g, the Galaxy A3 is ultra portable. MicroSD and NanoSIM card trays are situated under the power button and blend almost seamlessly into the A3's slender frame. The combination of the 4.5-inch screen, relatively thin bezels and overall slim profile help make the Galaxy A3 an extremely compact device. Reaching all corners of the screen is a doddle, even for those with small hands, and the perfectly positioned power and volume keys can be accessed without any hand gymnastics. Despite the unibody metal construction, no doubt a vast improvement over plastic, the rather plain rear of the Galaxy A3 still lacks the refined look of metal flagships such as the HTC One M9. Up top there's an 8MP rear-facing shooter taking up a central position, with a single LED flash to the left and speaker to the right. The protruding camera is a minor gripe, and can make typing while the A3 is resting on a flat surface a pretty wobbly affair. The Samsung logo is one of the few notable cosmetic features on the back of the Galaxy A3. The matte finish of the rear is welcome, keeping the Galaxy A3 free from unsightly fingerprints and smudges. While the metal rear is smooth and a little slippery, the A3's frame is comfortable to grip and the rounded edges conform nicely to the palm. For an affordable mid-range smartphone the Galaxy A3 offers incredible build quality and the absence of flexing and creaking is really quite satisfying. White, platinum silver, midnight black and champagne gold variants of the Galaxy A3 are available, and all carry the same inexpensive price tag.